Microsoft hasn’t updated Skype for Linux since June 2014. In the nearly two years since then, Skype has been falling apart. The Linux client was already behind other platforms, and it’s only fallen further since then. Even the features it does support don’t work reliably. Microsoft still offers Skype for Linux as an officially supported download, but maybe it shouldn’t. There are lots of problems with Skype for Linux. The user interface is extremely dated compared to Skype on other platforms. 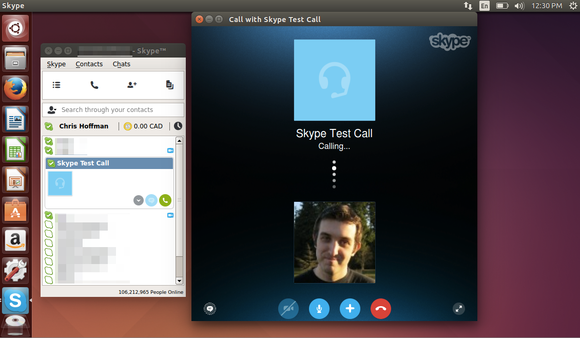 It also lacks modern features—the Linux version of Skype has never been able to join group video calls, for example. Many Linux users report they can’t join calls at all since February 22, 2016. They claim their contacts see messages informing them that the Linux users need to update their Skype clients. In my tests, I couldn’t reproduce this problem, and I was able to establish calls between Skype for Linux, Skype for Windows, and Skype for Mac. Joey-Elijah Sneddon over at OMG Ubuntu has run into this problem at times, but not always. He also encountered errors where instant messages sent to groups would arrive late or not at all, the Linux client couldn’t create group audio calls, and away contacts appeared as offline. Skype for Linux just seems flaky. Worse yet, some features don’t work on Skype for Linux at all, with no indication they’re failing. Modern Skype clients for other platforms can send photos and video messages. Skype for Linux doesn’t support receiving these photos or video messages. In the past, I’ve seen older Skype clients for other platforms display a message saying integrated photos or video messages aren’t supported, and provide a link you can click to view them on the web. But Skype for Linux doesn’t provide any indication at all that someone is sending you unsupported messages. If someone is sending you photos or video messages all day and you’re using Skype for Linux, you’d have no clue. You wouldn’t even see any indication that person is even trying to contact you. Skype for Linux is dated and clunky at the best of times. Microsoft may be betting on Skype for Web for the future. The web-based version of Skype already offers text-chatting with a more modern interface than the Linux client does. Eventually, Microsoft will likely update it to use the cross-browser WebRTCstandard. This means you could open Skype for Web in Firefox, Chrome, or another web browser on Linux and participate in voice and video calls, right in your browser. I wouldn’t be surprised to see Microsoft axe Skype for Linux when this feature arrives, pointing Linux users to the web version. But it isn’t here yet. For now, Linux users are stuck with an especially flaky Skype client. Thankfully, Linux users do have options. Google Hangouts, Google’s web-based voice and video chat system, fully supports Linux. Firefox’s integrated Firefox Hello system does, too. The increasingly popular Telegram application, which only supports text and photos right now, offers an official Linux desktop client that can reliably send and receive messages and photos, even between groups. These services are just the tip of the iceberg. Skype was once the only really easy way to perform voice and video calls online, especially for Linux users, but it’s now just one of many options—and an inferior one at that.